Cristina Paradiso (nee Piscinne’), 101, of West Brighton and native of Tricarico, Italy passed away peacefully with her loving family close by. Cristina is survived by 4 children, 11 grandchildren, and 28 great-grandchildren. She was the beloved wife of the late Michele Paradiso; loving mother of Antonietta Loffreno and late-husband, Pasquale, Rocco Paradiso and wife, Ottimia, Maria Carmela Paradiso and husband, Rocco, and Michelina Lamorte and late-husband Domenico. Cristina was born on March 5, 1916 in Tricarico, Italy where she raised 4 children on her own when her husband died in World War II at the age of 27. She was the daughter of Nicola Piscinne’ and Carmela Pisano. She was the youngest of five daughters; Teresa, Domenica, Rosa, Maria and Cristina. She was an amazing woman of great strength, wisdom and lived through many difficult times. She was able to send her children, Antonietta, Rocco, Maria Carmela, and Michelina to America and settled in West Brighton in 1959. It took her ten years for her family to be reunited in America. Upon her arrival in 1959, Cristina worked as a seamstress and later worked in housekeeping at Seaview Hospital and Rehabilitation Center in Staten Island. She later worked at Bellevue Hospital in New York City, retiring in 1976. She attended Blessed Sacrament church on a daily basis. She also attended the senior center in West Brighton. Most importantly, she enjoyed spending time and cooking for her family and tending to her vegetable garden. 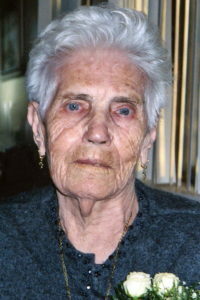 She raised her children, grandchildren, and was able to meet and babysit her great-grandchildren. Her family adored this great matriarch and she will be greatly missed. Heaven is lucky to have our Nonna Cristina. Funeral at Cherubini McInerney Funeral Home, 1289 Forest Avenue, on Monday, January 29, 2018 and will be departing at 9:30am. Mass of a Christian burial at Blessed Sacrament for 10:00am followed by an entombment at Moravian Cemetery. Viewing will take place on Sunday, January 28, 2018 from 2-5pm & 7-9pm. We are close to your sorrow for death of dear Cristina.